Our world is governed by laws, which is reassuring for most of us. Although the law of unintended consequences can make a mockery of well meaning legislation, and although from time to time we’ve all been tripped up by Sod’s law, in general laws are deemed to be a good thing. Science comes up with lots of laws and Professor Brian Cox did his best to explain a few laws of physics the other night on TV and for a moment I felt an inkling of understanding of Quantum Mechanics. The world of technology is also governed by laws, one of the most well known being Moore’s law. Moore’s law says that the number of transistors that can be placed inexpensively on an integrated circuit doubles approximately every two years. This was postulated in the swinging 60’s and has been demonstrated to be true ever since. Moore’s law is often conflated with a comment by an Intel executive, David House, who said that chip performance (or computing power) would double every 18 months, being a combination of more transistors on each chip and them being faster. House’s comment may or may not be a law, but it too has been demonstrated to be true ever since. Disk drives operate to their own law as well, often called Kryder’s Law. Kryder’s Law states that the magnetic disk areal storage density doubles approximately every 2 years, analogous to the doubling transistor count every 2 years in Moore's Law. The result of Kryder’s law is that disk drives get larger in capacity, but smaller in form factor. There is another law that pertains to network bandwidth. Nielsen’s law states that network connection speeds for home users increases 50% per year, which equates to a doubling every 21 months, just shy of two years. I’m not so sure this law holds true. The most common network technology used to connect users to the internet is good old fashioned copper wire. The use of copper wire means that Nielsen’s law can’t be true for most users. Copper wire is an excellent conductor of electricity but it also has electrical resistance. Ohm’s law is used to calculate the amount of resistance any given material has and from my hazy memory of school physics, 1m of copper has a resistance of 1Ohm. I also recall that the longer any given conductor is, the higher the resistance it has and that the smaller its area, the higher resistance it has. Copper wires as used to deliver broadband services tend to be very long and very thin, and while these were fine for delivering low bandwidth (or low frequency) analog voice, they are less well suited to deliver high speed (or high frequency) bandwidth. We can clearly see the tendency of high bandwidth (or high frequency) DSL technologies running over copper to lose much of their effective speed the longer the copper wire is. We can also see that the higher bandwidth DSL technologies lose speed at a faster rate than lower speed bandwidths i.e. 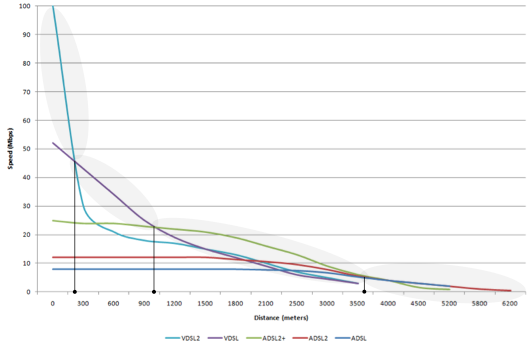 high speed VDSL2 doesn’t go as far as low speed ADSL. The upshot of this is that the further one lives away from the exchange, the slower the actual speed experienced will be for any given DSL service. This propensity to lose speeds over distance is known as Loop Attenuation that is caused by a combination of factors including Ohms law and frequency interference known as “cross talk”. This is why copper-based broadband services are often marketed with “up to” speeds rather than specific speeds, because the service provider cannot with any degree of certainty tell you what the actual speed will be. Which of course makes is it incredibly difficult for the consumer to decide which service is the most appropriate for them. As these distances refer to copper distances and not as-the-crow-flies distances, it is impossible for the consumer to work out how far they are from the exchange and hence to make an informed choice of service. And this invokes another law: caveat emptor.